Argentina's Chamber of Deputies (la Camara de Diputados) has approved a gay marriage bill, news agency Telam reported. The country's lower house approved the bill in a 125-to-109 vote. Lawmakers debated between moving on a bill that would give gay and lesbian couples the right to marry – including the right to adopt – and a civil unions bill that did not include gay adoption. “Heterosexuals have to have the wisdom to integrate minorities. It is very unfair to have the power and say, with my power: you cannot, I do not want you to be equal to me,” he added. Lawmakers had tentatively agreed to debate the bill last week but proponents failed to gain sufficient support to open debate. 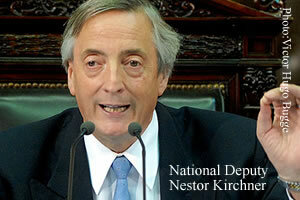 Nestor Kirchner, Argentina's former president and a current national deputy, was present for the debate and said he supported the bill. Kirchner relinquished control of Argentina in 2007 when he handed the reigns of power to his wife, Christina Fernandez de Kirchner. He currently helms the powerful FPV and represents Buenos Aires Province in the lower chamber. Gay marriage has remained in the national conscious since December when two men married for the first time in Latin America. Last week, a gay couple married in Buenos Aires, the men were the fifth couple to do so.